The two met in Warsaw which is hosting the NATO summit. Prime Minister David Cameron has said the UK will continue its support for Ukraine despite Britain's recent decision to leave the UK. 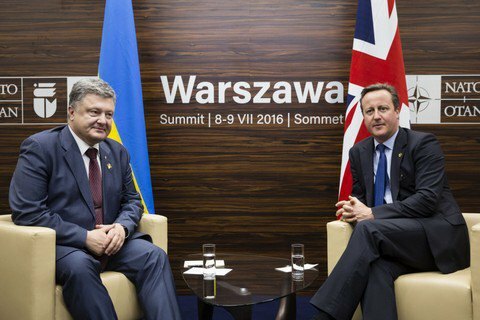 "We will find ways to continue supporting Ukraine in Brexit conditions," Cameron told Ukrainian President Petro Poroshenko at a meeting in Warsaw. Thw two discussed the international security agenda in the context of the Brexit. Poroshenko thanked the UK for its unwavering support and praised its financial and expert assistance in the implementation of reforms and training of the Ukrainian Armed Forces.